Who’s ready for the holidays and looking for some alternative gift ideas? I wanted to do one of these gift guides last year, but with a two month old, I didn’t quite get around to it. One good thing about waiting is that I now have more ‘crunchy’ items to add to this year’s list…especially since I own most of them. I’m not a girl that really wants shiny things (I’ll take them if given), and since becoming a mama, I’m more concerned about the impact my family has on our environment than about the latest fashion craze (sorry, sis). Honestly, it’s fun for me to do research, peruse wellness blogs, and find products for my home that will benefit all of us. There are still some big ticket items that I’m holding out for…like a Berkey water filter, but that will come soon enough. Browse my list and let me know if I’ve left anything out. I think everyone needs the opportunity to have correct ‘potty posture’ and should put one in your home. I will say this stool works wonders in the BM department, so even if you’re ‘regular’, do yourself or a family member a favor and get one. See my post here. If you’re trying to ditch the plastic (estrogen) in your life, you really should consider buying a glass water bottle from Lifefactory. They used to only carry water/baby bottles, but they now have wine glasses and different sized storage containers in their product line. See my post on it here. Have you been curious about this cool contraption that’s been buzzing on the interwebs? Well, do yourself a favor and put this on your wish list or get one for someone you know and love. I promise you that this spiralizer won’t disappoint-Emma has loved using it since she was three. If you need pasta-free dish ideas, see my post here. I’ve had mine now for over a year and absolutely love it! You can dry anything from fruit to veggies to herbs to jerky. It’s a great tool to have for those times you have extra produce that you don’t want to toss, or want to make snacks for when you’re out and about traveling. I finally got a dual flush, thanks to my mom, and am totally digging it. It’s a small contribution, but why not save some dough while saving some water (and confusing house guests)? This way, you don’t have to let it mellow if it’s yellow. These guys are still on my wish list and I’m hoping to grab a couple very soon. I read about them from The Wellness Mama and can’t wait to filter out the chlorine in our home. Even if you haven’t delved into Essential Oils (EOs) too much, like me, it’s always nice to have one of these around. These beauties are heat and water free and come with an automatic shut off timer. They’re perfect for diffusing your homemade Thieves oil. We have one of these in each bedroom and they are great for purifying the air while providing ambient light…which is nice for those middle of the night feedings. They are available in different shapes and sizes and come with a nifty dimmer switch. This little handheld guy is perfect for brushing all over your body to stimulate the lymph system; help the body rid itself of toxins and increase circulation or energy. It feels pretty harsh at first, but I generally do it before I shower in the morning. See more info here. This water system has been on my ‘want’ list for several years. I’m not sure what is holding me back (besides the price), but it’s partly due to wanting and researching a whole house system. These filters are great for filtering out all kinds of chemicals and can be used with harsh water, like river water. More info here. Whatcha think? 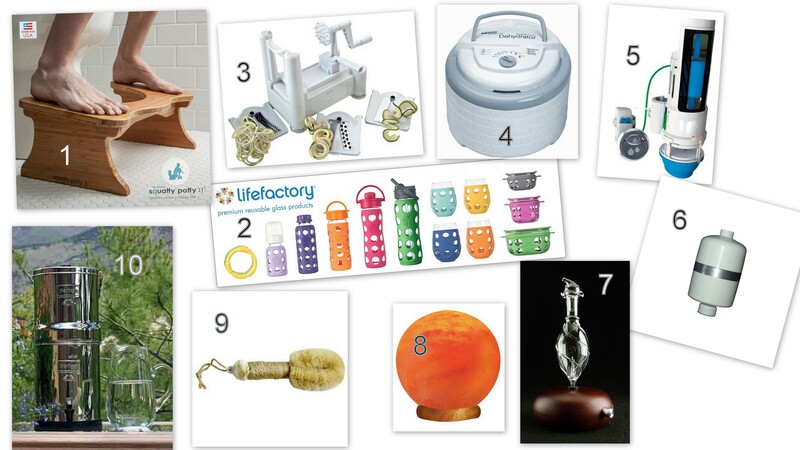 Are any of these items on your Wish List or am I in my own crunchy world? Have you finished your shopping or are you (way) behind like me?